I flagged this question for being off-topic (app development) when I was working through one of the queues. When I was browsing later, I looked at the question again and started to flag it, when I saw that I had already done so. However, the SE system had two flag options grayed out instead of just one. I know I definitely did not mark this question as a duplicate. I even checked my "raised flags" page to make sure. Is this a bug? 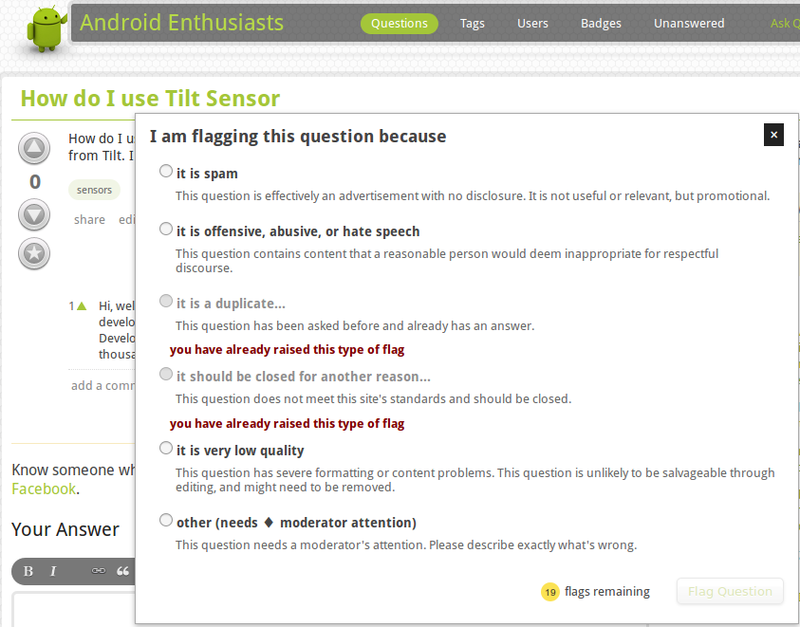 Or is there some other reason why the system thinks I've flagged the question twice for two different reasons? All the close reasons count as one "type of flag" for this purpose. If you've VTC'ed or flagged with a close reason, you can't VTC or flag again with a close reason, even if it's a different reason. The spam and offensive flags work in the same way: if you've flagged as spam, you can't also flag as offensive, but you can still VTC or flag with a close reason.